THE DAY HAS FINALLY COME July 16th, 2017… Better known as the premiere of season 7 of Game of Thrones! 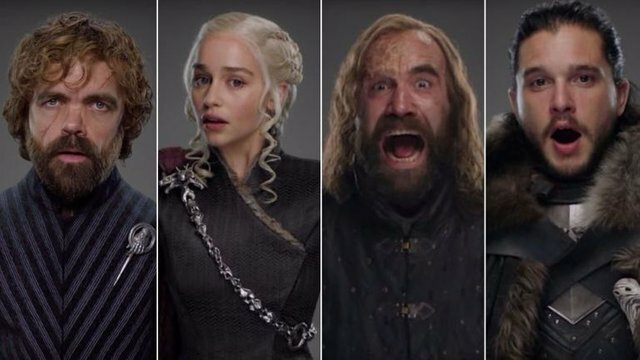 With all of the prediction buzz, I wondered what do the stars say will happen to our favorite characters tonight on GOT?! After assigning each to the astrology sign that seemed to best match their personalities I then turned to horoscope.com for some stargazing revelations. Let’s see what their horoscopes have to disclose as we look deep into the future….. all the way to 9pm tonight…. Libra- Romance blossoms for you, Libra, perhaps after a long standstill. A new stability and security may settle on love relationships as well as close friendships. Children could be a great source of warmth and pleasure. You might want to channel some of this blossoming positive energy into a creative activity of some kind, which should increase even further your sense of contentment and well-being. Last time that we saw Jon Snow he had just reclaimed his rightful position as the King of the North thru his victory at the Battle of the Bastards. Looks like the stars are predicting a continuance of his current win streak with us seeing him in a good place today and with some love action?!? You may know nothing Jon Snow, but we know it’s about to get hot and heavy for you and it’s giving us all some major cave flashbacks. Pisces- Trying to get too much work done in the course of the day could prove self-defeating, Pisces. Your energy isn't what it usually is, and you're probably operating on adrenaline. Consider the situation carefully and list your tasks in order of urgency. The world won't come to an end if you don't get them all done by the end of the day. In the evening, watch a movie and order a pizza. I think we can all agree that we would be pleased to see this prediction come true, after her recent Bolton ordeal and her awesome come thru with the Knights of the Vale during the Battle of the Bastards, Sansa deserves a little R&R. We know with the challenges that still remain ahead she may be tempted to continue grinding, but hope she takes some time to relax and yes, pizza makes EVERYTHING better! Cancer- Some kind of settlement, grant, or bonus that you've anticipated for a long time may finally show up, Cancer. This should make your day! You may want to celebrate. A chance to attend a large social gathering might come your way. Have fun! Tonight don't be surprised if vivid dreams - some great, some sad - come your way. Keep a notebook and pen by your bed so you can write them down. Littlefinger saved the day at the Battle of the Bastards and perhaps this is why it is predicted he would soon be getting his just dessert. With a celebration at hand and him finally getting something he has long desired we can only wonder what is it Sansa promised him in return for his aid. Leo- Today you may put a lot of energy into your romantic relationship, Leo. The astral energy is encouraging you to focus on romance. Give your significant other a special gift to show how much you care, and spend some time alone together. Any romance initiated or advanced today is likely to prove stable and long lasting. Don't let fear stand in your way. Move ahead. Virgo- Too much work and the resulting pressure over the past few days may have you feeling too tired to do anything more, Virgo, although your optimism and enthusiasm are still intact. Don't be too hard on yourself if you're dragging by the end of the day. If you take care of yourself, you will soon recharge and be your old self again. In the evening, read a good book. Sailing to Westeros at the side of Daenerys with the Iron Throne in their eye has to be a stressful position, planning for the battle of a lifetime facing his larger than life sister Cersei. It’s good to think Tyrion is feeling good about the upcoming battle and perhaps the long journey to King’s Landing will give him some time in the recent chaos to unwind and clear his mind with a good read. Capricorn- Your financial picture continues to improve. At some point during the day, Capricorn, you might have the feeling that you aren't working hard enough to keep up your current forward motion, and you might worry. This could be a good motivator, but you don't need to push yourself much harder than you are now. You're on a roll and it's likely to continue. Keep moving, but pace yourself. Varys has been doing good with his new alliance with the Mother of Dragons. It’s nice to see him on team Daenerys and fighting the good fight. Keep it up, but as the stars warn don’t try to take on too much. Scorpio- You might host a social event in your home tonight, Scorpio. You may be nervous at first, wondering if all will go well. Your efforts should produce the results you want. You might be introduced to new contacts, which could lead to increased professional opportunities. Take a walk after everyone has gone. Your mind will be going a thousand miles an hour and you will want to clear your head. Who could forget Cersei? And of course she wouldn't want anyone to forget her most epic of recent victories, the annihilation of the sparrow and his crew in a mushroom cloud of neon green vengeance. Perhaps this is why the stars are predicting a happening party for her to celebrate her crowning as the Queen of the Seven Kingdoms. It is also foreseen that she is going to be gaining some new contacts, ahh what poor soul is going to join allegiance with the character we all love to hate now? Aries - A despondent friend may need some cheering up. Your ability to nurture and listen sympathetically will definitely prove beneficial, Aries. Take care not to absorb any of this person's dejection. Your life should continue to go well with professional successes leading to new friendships and goals. Hang on to your enthusiasm and optimism while showing compassion for others. Sagittarius- Paperwork, perhaps contracts or other legal documents, might need attention so you can move ahead with your projects, Sagittarius. These projects could involve writing or speaking. Your mind is in just the right space to participate in anything involving communication, so doors of opportunity may open for you in this area. Lift your chin and get going. You will be glad you did. Perhaps the Hound is set to take a leadership role as the stars see communication as a key to his future success. Last season we saw a lot of personal growth and a sense of peace come over him only to be shattered by the slaughtering of innocent people prompting him to once again embrace violence for retribution. As he now heads north to face the impending White Walker invasion with the Brotherhood Without Banners that fire may burn even brighter making him a front runner in the war to come. Taurus- Many projects to complete before a deadline might have you feeling pressured, Taurus, but your determination is likely to drive you to try to get it all done even if it seems impossible. Don't try to do it all yourself. Ask for a little help. You can accomplish your ends without putting undue pressure on yourself. Try to relax today. Nothing runs smooth on Bear Island without Lady Lyanna Mormont, and sometimes that pressure can be a bit much even for the toughest of us. Last we saw her she was aiding in the Battle to re-win the North for the House of Stark, now perhaps she needs a hand in return? Gemini- You've been doing very well, Gemini, but today you might feel more focused than ever. The path ahead seems clear and well defined. You're anticipating the future with motivation. You might be considering a long trip abroad or perhaps going back to school for an advanced degree. This is a good day to research and finalize your plans. Ahh Bran, we are still not too happy with you since the Hodor incident and your lack of listening skills that always seem to lead you to trouble, but we must continue on as you seem to possess a key to winning the war against the White Walker ice zombies. Perhaps your recent discovery that Jon is the son of Rhaegar Targaryen is gonna help us out further down the road as we wait to see what you do next. Now that you’re the Three-Eyed-Raven we suggest that you LISTEN to the stars and spend some time plotting and planning your next move. Aquarius- Even though all continues to go well for you, Aquarius, your mood may vacillate today. In spite of all the great things in your life, at some time during the day you might feel a little blue. Don't read too much into it. It's probably just the result of low biorhythms. Try to distract yourself with physical activity. Go out with some friends and have a good time this evening. Don’t be sad Brienne of Tarth! We know that Riverrun didn't end as you would have hoped and after a reunion with your homie, Jaime Lannister, you have once again separated but keep your head up! Spend some time with friends… newly found friends like Tormund Giantsbane perhaps? I feel safe to say in Game of Thrones tradition we are gonna be getting more than we bargain for and are in for surprised the stars can't even see. Let’s do this! Wow!!! What a great post. I can't wait till the premiere. Less then 6 hours away!!! Mother of Dragons for the Throne!! Great post! I think Littlefinger compromised himself when he revealed his intentions to Sansa. Now she knows what he wants, wich gives her a very big edge on him. He played the game perfectly until that moment. Congratulations! This post has been upvoted from the communal account, @minnowsupport, by beartribune from the Minnow Support Project. It's a witness project run by aggroed, ausbitbank, teamsteem, theprophet0, and someguy123. The goal is to help Steemit grow by supporting Minnows and creating a social network. Please find us in the Peace, Abundance, and Liberty Network (PALnet) Discord Channel. It's a completely public and open space to all members of the Steemit community who voluntarily choose to be there.